I had the case of the copperhead, or it might have been a fox snake, but it does not sound as dangerous or life threatening. Though it does not have a rattler, it does rattle, and scared the life out of me and the exterminator's who was here at the time. He insisted they do not take care of snakes. Someone suggested if the snake had slanted eyes it was poisonous, if round it was harmless, but heck who's going to directly stare at the cold blooded reptile. Nature decided to plot against me and the exterminator was here to take care of the mud daubers, dirt daubers, dirt diggers, mud wasps or however you choose to call them. My bee problems were far from over. Then there are these aggressive big fat ones with furry yellow in the middle, approximately two inches long, that decide to get suicidal and plunge right towards me every time I step out of the house. I am living right out of a cartoon. J was under the weather so I muddied many pairs of shoes moving the hose to give the grass seed a good soak, as good as our well will allow. Took out the recycling and trash and dragged it all the way back down the driveway to the garage and in between sprinted and squeezed in some squats. Luckily I am not surrounded by many neighbors as it was not a pretty sight, me running, flailing my arms. Watched the dog so he won't escape down the rain drain and be lost into oblivion while all along working on some research, recipe testing, articles and few opportunities that arose. I was telling someone recently my life isn't glamorous, I just find glamor in the mundane, the every day life. Speaking of glamor, this elusive vegetable, the artichoke, is a show stopper. I wished I lived in Northern California or along the Mediterranean to get the very freshest specimens. 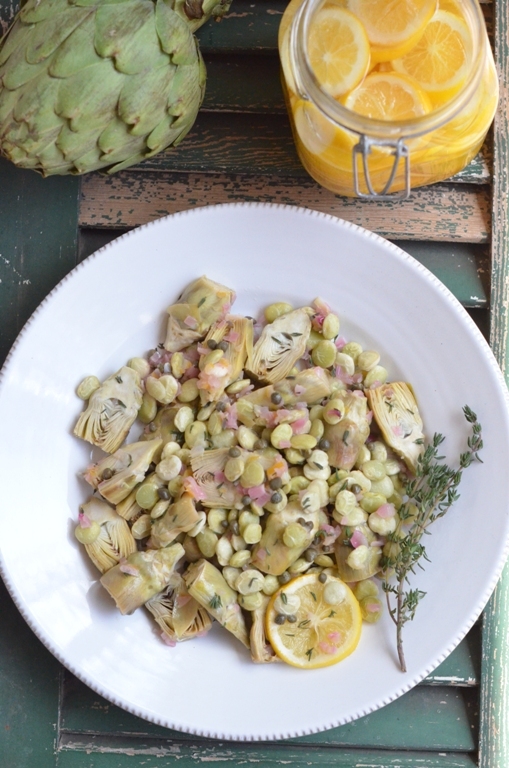 The baby artichokes preparation is relatively easy and the results are luxurious. Grace your Passover or holiday table with this dish, it's so delectable. Both artichokes and fava and other beans are luckily are now in season. I used lima beans as I had some frozen.Inspired by a fish recipe I saw at Al Hashulchan magazine in Hebrew. Follow Saveur's Trimming Baby Artichokes photo gallery and directions. 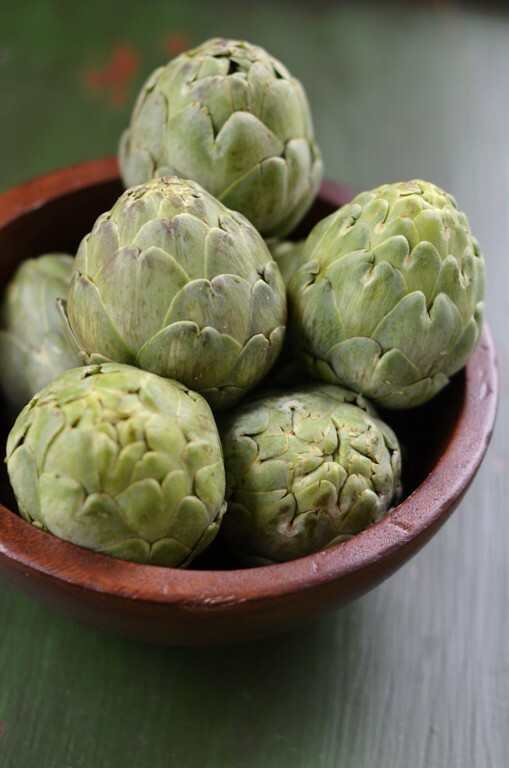 As artichokes are prepped halve each artichoke lengthwise and sprinkle them with the juice of 1 lemon, coat well so they won't oxidize much. On medium heat, saute the shallots until soft, add the artichokes, lima beans and the rest of the ingredients . Add more wine or water if necessary if sauce thickens too quickly. Cook for total of 20 minutes or until artichokes and lima beans are soft. Garnish with additional capers, fresh thyme leaves and 1 chopped slice of Meyer lemon Moroccan preserve for color. *Cook's note: Since the Meyer lemons are so much more delicate than the regular lemons, if you make a jar of the Moroccan preserves today it will be ready for use within a few days, just in time for Passover. You can also buy them in Mediterranean grocery stores or just use lemon juice instead. What a beautiful dish and has many of the flavors I love! If someone would cook for me, this is definitely something I would like. Thanks for sharing this, Shulie! TY Annapet! So easy to put together you should make it especially with the beautiful fresh artichokes by you. Great dish, Shulie, that really allows the earthiness of the artichoke to shine. I too wish I lived in a place where I could get them fresh. How great would that be? I know, right?! Well put Bri 'earthiness'. A beautiful salad! That combination of ingredients is awesome. A great idea. I know, Yikes! :) TY, So lucky artichokes in your farmers market. Glad to hear you were able to enjoy some time with your family over break. This dish sounds so light and delicious. I haven't tried using fresh artichokes before, but I've seen them in the market. Jeanette, you can use the frozen baby artichokes instead or the frozen artichoke bottoms. Looks so fresh & healthy..love all of the flavors going on in this dish..love artichokes! TY Sara. Aren't artichokes the best?! I love the second shot of the artichokes in a bowl. Just stunning. Great combination of flavors Shulie. This is a beautiful presentation and recipe! Heehee NOT glamorous at all!! :) The preserves def. give it a punch. TY Lora! Even though you may think your life is not glamorous, but your dishes and recipes are always! Love your flavoring and the use of the ingredients. Though I'm still thinking about the part where you arms are flailing and doing squats up and down the driveway. Would love to see that, ha! I was excited to find another DC blogger! 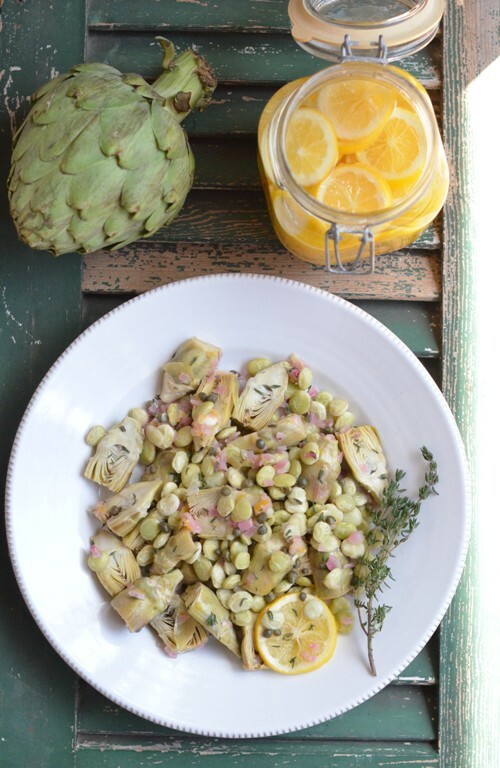 I do like the use of the lemons and artichokes in this recipe. Hey nice meeting you too Nik. Going right over to visit your site. TY! Another beautiful creation! Love it. the colors here are so beautiful. totally bookmarking it! TY Junie. Let me know when you make it! I just LOVE that you said you felt like you had to produce but took a break to reconnect. I've been feeling that way lately and was sick and blah blah blah. It's so nice to know I'm not the only one who feels that way every once in awhile. As always your pictures are inviting and mouthwatering! TY Krista for sharing as well so am not feeling alone in this feeling. Thx for your kind words about my photos. I always feel there is so much more to learn! TY Beti. Me too. Today. I wish someone would make it for me this time though:). Love your photography, Shulie! Yes, long time no talk. Hope you're doing well. These baby artichokes look so amazing! I need to try to make this! TY Julie means a lot especially since I know how meticulous you were about studying the ins and outs of photography. TY Kariann. happy cooking to you as well! You must have had so much fun with your son and his friend. Of course you should have stopped everything for his visit. I certainly would have. When they grow up and go, you only get small bits of their time. Baby artichokes are incredibly difficult to find here but occasionally we get lucky. I'm going to save this recipe and start watching the market. I know every little bit matters. I think even here in the US they are classified baby but are really mature ones that were in the shadows, growing at the bottom of the stalk that didn't get much sun. Technically mature small ones. I believe in France they actually harvest them when they are tender young. Ty Kiran, see my comment above. In my area we see them in every market pretty much though not as vibrant as in California where they grow. The long trip east made its mark. This looks and sounds lovely! I will be giving this a try myself.